Almost exactly a year ago the future of the Unitary Plan was looking uncertain after a group of rowdy residents, mainly from eastern suburbs who had been whipped into a frenzy by the likes of the NZ Herald and UP opposition groups like Auckland 2040, complained to the council about the plan. At issue was changes made by the council to zoning in response to broader changes to the plan as a result of submissions but which those opposing the plan labeled “out of scope”. The council subsequently folded to the the claims the process was being abused, even though it wasn’t, and had with withdraw from taking part in the discussions entirely. A bit of an own goal if ever there was one. Ultimately the call as to whether something was out of scope was for the Independent Hearings Panel (IHP) to make and they allowed other submitters picked up the council’s evidence. When their final recommendations were given the council, they ruled the changes were in scope and incorporated them into the plan. Since the council passed the Unitary Plan in August, one of the main appeals against it – brought by the Character Coalition, Auckland 2040 and others – has been on the issue of those out of scope changes. Yesterday we had some good news with the High Court releasing a ruling and calling the approach to “scope” lawful. The High Court has today released a decision ruling that the Auckland Unitary Plan Independent Hearings Panel’s approach to “scope” for residential zoning in key test case areas was lawful. The decision follows a preliminary hearing held in November 2016 which considered whether the Panel approached the matter of “scope” correctly in relation to certain areas of residential zoning in the Proposed Auckland Unitary Plan. The court was formally asked to rule on seven agreed questions of law. The issue at the heart of the preliminary questions potentially affected approximately 29,000 properties originally zoned Single House and Mixed Housing Suburban in the notified Proposed Auckland Unitary Plan. The Court addressed the matter of scope by focusing on residential zoning in a number of test cases in Mt Albert, Glendowie, Blockhouse Bay, Judges Bay, Grey Lynn, Takanini, Howick and Parnell. 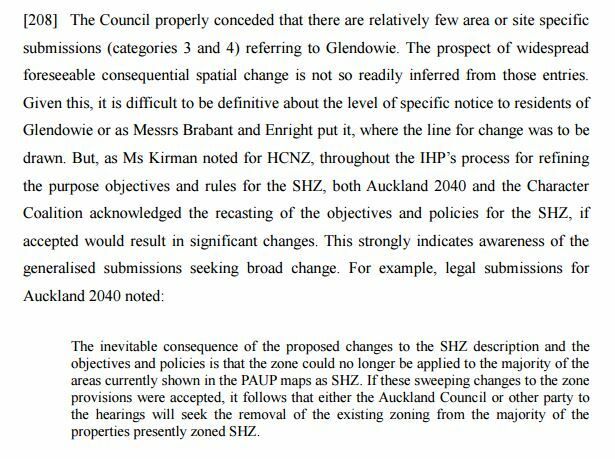 The court ruled that the IHP has approached the matter of “scope” correctly, with the exception of two site specific test cases – 117-133 The Strand, Parnell (relocation of viewshaft), and 55 Takanini School Road (notified as Industrial and rezoned Residential). This is good news and while it doesn’t resolve the appeals, it should go a long way to helping do so. Of course the Character Coalition aren’t happy, continuing to claim people were denied a say in what happened, despite everyone having the same right to submit on the plan. In fact the judge even called them out for this. There are still appeals going on but hopefully they can be resolved shortly so we can get on with building homes for people. Thank God that the NIMBYS – and the “nothing-anywhere- at-anytime” brigade – were defeated. GOOD! SHAME on the NIMBYs ! In principle I’m all for intensification. But it is going to put an unbearable strain on the infrastructure of sewage/ storm water. Billions maybe? Central government will have to come to the party, it can’t all be lumped onto the citizens of Auckland. That cost is going to happen if we go up or out. Going out = more km of infrastructure so has increased maintenance costs per person compared to high capacity infrastructure for intensive area’s per person. People will always see the high $$ for a single project without the realisation of the population its serving, they really should release figures on a $per person its serving! +1. Yes make this more publicly visible would help. That is not quite how the Council does the assessment. They assume anything required to achieve what they want to do has no cost whatsoever. Anything required to do the things they don’t want to do has enormous costs. For example the $1 billion to $2 billion needed to separate and upgrade the sewers for the old Auckland City area gets left out of the calculations while any greenfields sewers must be counted. Any large pipes needed within a block of flats are excluded, any pipes in a street to serve the same number of suburban houses must be counted. Long distance trunk sewers shouldn’t be built to serve new housing areas on the edge of the city, the new trunk sewer to bring West Auckland’s crap to the treatment plant build by North Shore ratepayers that was meant to cater for the next 20 years gets built without question. Watercare claims Rosedale can handle growth in the northern area until 2070. And half the reason they’re doing it is to free up capacity for all the central development. The cost to take the crap out off the center is gunna be huge. You are aware that we need new trunk capacity no matter where development occurs right? we just need way less of everything lower level than that for intensification. I don’t think they are saying they have capacity in the activated sludge until 2070. They have space to build more. And to get to 2070 assumes they can continue to dump the final effluent into the gulf and only have to comply with standards by the time it reaches the surface and dilutes with seawater. Regardless it is yet another example of the North shore ratepayers getting screwed by the new Council. Yes the supercity saved Waitakeres arse when it came to the product of said arses. God knows what they would have done – they didn’t have a plan in place. I find “consultation” to be overdone anyway (it happens at the ballot box and that’ll do) but this is debating the appropriate manner of consultation… it’s way too easy to stop things happening in NZ just on the basis of personal dislike or uneasiness.